Cllr Ian Stephens, Chairman of the Local Government Association’s Culture, Tourism and Sport Board writes about #OurDay: Every year people in local government and public services get together for a 24-hour tweetathon to raise the profile of the great work going on in communities across the country. #OurDay, which takes place on Wednesday 18 November, saw more than 8,000 people getting involved on Twitter last year, sending 16,500 tweets and reaching more than three million people. Councillors, teachers, foster carers to chief executives, librarians and football coaches tweet using the hashtag to provide an insight into what they get up to in the course of their day, while helping to raise awareness among the wider public. Launched by the LGA in 2012, #OurDay originally came about as part of the UK’s contribution to International Social Media Week. It was also recognised as a great chance to promote public services and how they exist for everyone, as we all come into contact with them at some point in our lives. The name #OurDay seemed appropriate as it could be used by those working in these services to tell people about what they do and the wide variety of roles, but could also be used by the community to say something positive about their experience. #OurDay is there to tell the good stories – from the everyday to the inspirational and extraordinary. With this year's event taking place only a week before the Chancellor’s Spending Review, it is expected to be the biggest yet and all local services, including libraries, are invited to take part. 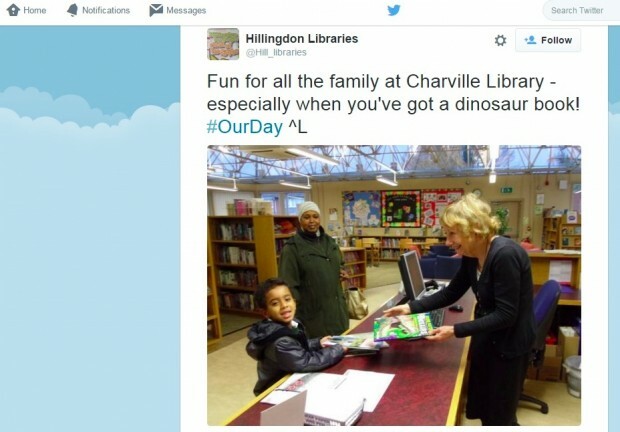 This represents an ideal opportunity for those working and volunteering in public services to spread the word about what they do on a typical day and last year libraries were among those leading the charge on Twitter. Lots of examples, including: Hackney Council’s Community Library Service, which posted photos and information about delivering books to housebound residents and children's nurseries too far from their nearest libraries. Plymouth Council promoted its eBook online borrowing service, featuring a selection of titles that local readers can swap and how new books and resources are being provided to support school teachers throughout the district. Surrey Libraries offered information about their 24/7 online services, plans to expand their catalogue and about books and sources for those with dyslexia. At Kirby Library, Knowsley Council was delivering IT Taster sessions to residents on the day while Leeds Central Library hosted a family history workshop. 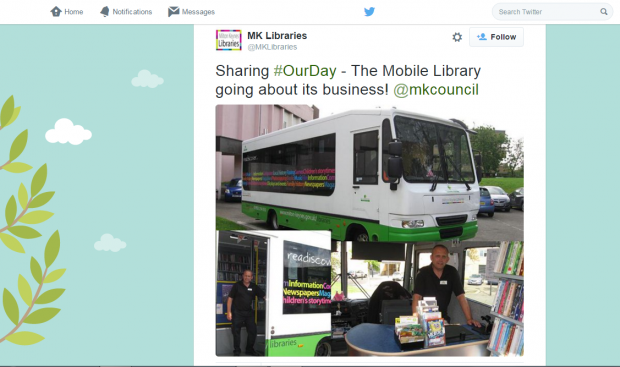 Milton Keynes Council posted photos of its mobile library on the move while Lambeth Council ended last year’s #OurDay by hosting a photography workshop at Brixton Tate library. Whether you work or volunteer in a library, or in any other public service, it’s easy to get involved. Simply share your story on Twitter using the hashtag #OurDay throughout Wednesday 18 November 2015. You and your library can also sign up for the Twitter Thunderclap which will send out a simultaneous tweet at 7am on the day or find out more via the LGA’s website.